After his horrible but widely-viewed freestyle at the BET Hip-Hop Awards, it only makes sense that Eminem has a new album to promote. Yesterday, the Detroit rapper’s manager Paul Rosenberg posted a photo to Instagram which seemed to focus on a new Yelawolf record, Trial By Fire. But there was a hint in the background: an ad for what appears to be a drug called Revival, with Eminem’s ubiquitous backwards “E.” It’s all fake, of course. As Pitchfork points out, Reddit sleuths uncovered a print ad directory for the fake drug, which revealed that the campaign was purchased by Em’s label Interscope, along with a fake website for Revival. There’s a fake commercial and 1-800 number you can call. 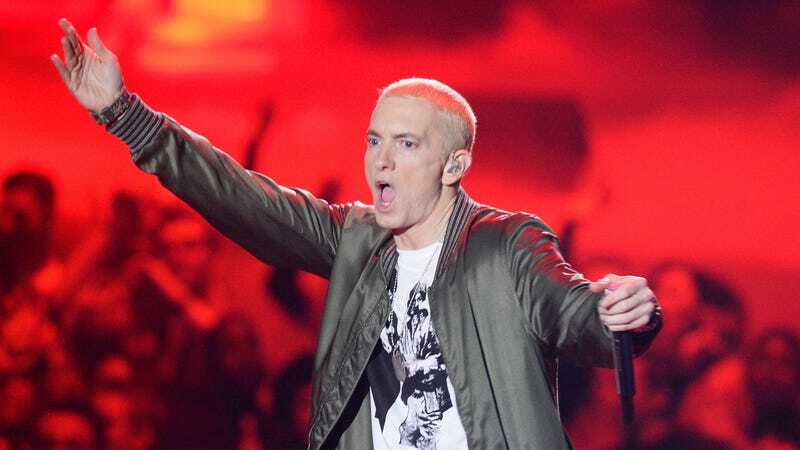 Both the commercial and phone message list ridiculous side effects, include numerous references to Eminem lyrics, and feature a snippet of his 2011 single with Dr. Dre and Skylar Grey, “I Need a Doctor.” His new album’s probably called Revival. Last year, some speculated that a Trump presidency would lead to urgent, polemic art. But rather than evolve, we seem stuck in the past. Instead, we’ve been given records—and press campaigns—that were sprang forth from a time when it didn’t seem possible Trump would take office, even if they were conceived post-election. From Arcade Fire’s Everything Now to Katy Perry’s Witness, Kid Rock’s album rollout-as-fake Senate campaign, and Taylor Swift’s corporate takeover with Reputation, it makes the deluded bloat of past elaborate rollouts feel quaint by comparison. Some of these are largely apolitical works, but the few that tap into the fake news zeitgeist seem to actually wrestle with how misinformation can disintegrate a culture. The pendulum will probably swing back to surprise releases for blunt impact in the next year or two, but it’s too late. I am very tired.